It is widely known that user error tends to be at the root of most, if not all, car accidents today. Many motorists believe driving to be almost second nature, making them comfortable to do other things while behind the wheel. This lack of attention to the task of driving safely, referred to as distracted driving, often results in car accidents, which can leave people injured or even worse — dead. Again, anything that diverts your attention away from driving is considered distracted driving. And since distracted driving often leads to accidents, it is important to understand ways to avoid such incidents. One of the biggest causes of distracted driving tends to be cell phone use. Whether sending a text or trying to make or receive a phone call, turning your attention to your phone, even for one text message, can prove costly. In order to avoid this distraction, you should do your best to avoid using your phone except in an emergency situation. Even then, you should pull over to the side of the road before using your cellular device. Another easy tip to avoid distraction is to avoid eating or drinking while driving. Spilling food or a drink on yourself while driving can immediately take your attention away from others on the road. Make time to eat before or after you get behind the wheel. It seems silly to view passengers as a distraction, especially since many vehicles today are passenger vehicles. But conversations with friends or engaging in activity with your passengers can leave you attention divided, which is not safe. Let your passengers know you want to concentrate on the road and request they avoid any actions that can compromise your safety. One last tip for avoiding distraction is to make sure you are well-rested before driving, especially for long trips. Drowsiness can increase the risk of a crash by almost four times. If you feel tired or fatigued, get off the road and take the time to rest. Were you in a car accident where the other motorist was driving distracted? This almost always leaves liability with the other motorist but proving so is not easy. 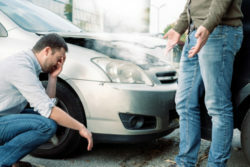 That is why you will need the help of an experienced car accident lawyer. The Paris Firm in Chino Hills, California has the experience to help you with your car accident claim. They will make sure you are fully compensated for any losses suffered. Even better, an experienced personal injury lawyer can also help if you were injured in your accident. You should not be responsible to cover the costs if your injuries and accident were caused by a negligent driver. Let The Paris Firm represent you and get you back on track to recovery. You can contact them today by filling out the online form.